CHECKPOINT is a webseries: Raising awareness about mental health issues and helping those affected, using the power of video games. 959 backers pledged AU$ 63,000 to help bring this project to life. To everyone who came together to make this real - we can't thank you enough. We can now deliver a high quality, 16-episode webseries tackling mental health issues using the power of video games. We'll keep you updated along the way, and I cannot wait to show you what we create. We are a health promotion charity in Australia and New Zealand, which means your contribution is tax-deductible. Every cent goes back into our nonprofit work, connecting mental health resources with video games and technology. This project is just one of our many activities. Find out more, and become part of CheckPoint's future today. Mental health issues are the single biggest cause of disability in young people, and one of the biggest causes of death for people under 30. Two thirds of people never get the help that is available, because it is too expensive, too stigmatised, or they simply do not know about it. What if we could change that? Research shows that people are much more likely to use the internet to look up their symptoms and try to help themselves, than they are to go to a doctor. We want to help these people to understand what they’re going through, find the resources that are right for them, and let them know - you are not alone. A high quality, 16-episode webseries about mental health and video games. That's up to 160 minutes of premium, evidence-based, potentially lifesaving information which is catered specifically to you - the player. By showing your support, you'll have exclusive access to a whole bunch of resources and incentives that we just simply can't offer to everyone. This includes early access to every episode, HD files of the entire series, and your own copy of the soundtrack (composed by talented YouTuber DeanCutty specifically for CheckPoint), pins, prints of the artwork commissioned for the series by the incredible Toby Allen, and credit recognition. We're also very excited that we can offer our backers the chance to actually BE part of the series itself, to contribute to its direction and become immortalised in the project. These episodes would contain vital education about each condition, with interviews with special guests who have lived experience (developers, content creators, and more). The goal is to raise awareness, and connect with people where they are. Depression and anxiety are so common that they are getting two episodes each. This lets us get more in depth on the physiology of these (often debilitating) illnesses, to create something that's informative and also relevant to our audience. The season also focuses on professional aspects of mental health for those in the industry - an area that has been sorely missing in the past. It would highlight how to recognise common problems, the benefits of employee engagement, as well as how to - and why we should - represent mental illness more appropriately in games. These are issues we already speak about at conferences, and the persistent feedback we get everywhere in the world is that there needs to be more of this! We can't afford to go to every conference so we want to create something you can access whenever and wherever you need it, that you can share with colleagues, and will rewrite the culture in this industry. I first became familiar with Dr. Jennifer Hazel’s work after watching her presentation from the 2017 Game Developer’s Conference entitled “Invent a Game, Reinvent Yourself.” As someone who not only plays video games, makes video games, and dealt with a nasty panic disorder, the presentation spoke to me – and it’s something I wish I’d seen back in 2001, when I was going through the worst of it. Feelings of shame, fear, and helplessness are all too common among those suffering from mental health issues; often, it makes taking that first step towards seeking help incredibly difficult. Easy to access resources, such as this video series, are often invaluable in helping people get past that initial hurdle, and as such, can be life-changing (if not outright lifesaving). Having since met Jennifer and spoken with her at length, it’s safe to say she’s incredibly passionate about her work and dedicated to making people’s lives better. I hope you’ll consider supporting her project, and I hope this series will encourage people struggling with mental illness to seek the help they need. Unfortunately there is still a significant stigma around mental health issues, but we feel that with accurate and empathetic representation, this can change. CheckPoint writes articles exploring character psychology - what makes them tick? How have their experiences shaped who they are? What really is going on inside their mind? Not only does this break down stigma by highlighting mental health in context, but it is also helpful to those who recognise their own vulnerabilities in a cherished hero. The second part of the stream would look at the work being done to use games for positive purposes. We'll explore the current research, discussing psychology, safety and more. If we achieve our funding goal, we will have enough money to create 16 episodes. Each would be completely free for anyone to view, all over the world, at any time. If we charged for the resources we want to make, it would prevent the most vulnerable people from being able to access them. That's why we've come to Kickstarter. This is a unique opportunity for you to be part of something that could change lives. As a reward for being awesome, caring about mental health, and contributing to a game-changing project, you can pick from rewards that range from pins to prints to getting your name in the credits. You can check out the reward tiers on the right. We have tried to reduce costs so we can focus on creating the best series we can for you, but we have managed to get some great incentives! Think of your closest loved one - it could be your friend, family, partner, child. Now think about them experiencing symptoms of depression or anxiety. They could be unable to leave the house, or find themselves out of work, losing friends, for a health problem they never asked for. For a lot of people, this is something that is all too real. In 2017, depression topped list of causes of ill health. Over 26 percent of all Americans over the age of 18 meet the criteria for having a mental illness. Within 20 years, mental illness is predicted to become the leading cause of disease worldwide. Around the world, almost one million people die due to suicide every year, and it is the third leading cause of death among young people. This is a crisis, and one that we can change, together. We believe that this series could open to door to other opportunities which could help people. Every year at PAX Australia, we do a panel called “More Than A Game: Playing For Mental Health and Wellbeing”. Every year at PAX Australia, that panel is packed out with the most engaged audience we’ve ever seen. We even did live research and found overwhelming results - 81% of our 400 strong audience believed games had helped them psychologically. You - the gaming community - REALLY want to talk about mental health. It’s clear to us this is a vulnerable population and one that deserves the right to mental wellness. That community inspired us to do what we do here. Games are changing the world in all sorts of ways. Let's harness that. CheckPoint are in a totally unique position to pioneer this space. We’re run by both mental health professionals and game developers, who each have years of experience in the fields contribute to the company. We have a feature-rich website full of information about mental health, links to useful resources, detailed discussions of apps and games for wellbeing, and heaps more. We create and freely distribute publications which anyone can download, to help with stress and distress, and get the most out of life. Recently we launched our 3-Step Thinking Hack Pack for free. The CheckPoint Series is one of our digital mental health promotion programs, and will add to our existing range of activities which aim to educate, raise awareness, and assist in help-seeking for people all over the world. Our programs include Game Therapy, Convention Wellness, Playing It Safe, and more. We lead workshops for workplace wellbeing, consultancy to guide mental illness representation, and public speaking at events. We have spoken at IndieCade as the Keynote, and at GDC 2017, where our talk was voted top 5 in the Advocacy track and our speakers got a 97% approval rating. 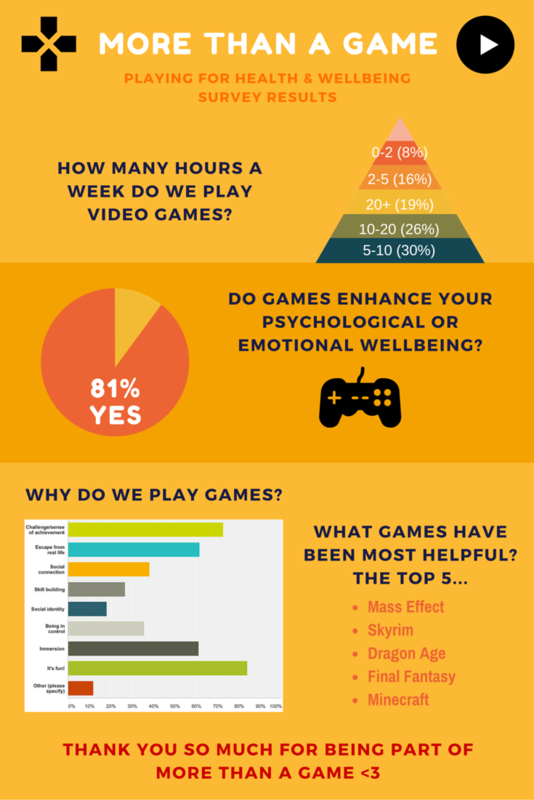 We are currently recruiting participants for our study, "Exploring the Psychological Benefits of Video Games". Please take part! With your support, we will continue to grow, making our mission sustainable and feasible. As a non-profit, every cent we receive goes back into the company to deliver our activities. We have to abide by strict audit conditions, so you can be reassured that everything donated through the Kickstarter goes directly into the project we’re advertising. And if you're in Australia, your pledge counts as a tax-deductible gift as we have DGR-1 status. Scripting is done entirely in-house by our own team. No consultancy fees required! We are working as much as we can with organisations who do pro-bono work, to align with our socially conscious cause. We will feature diverse voices and be as inclusive as possible in our series. We truly believe that this should be relevant to the gaming community, and so are working within it with all our contributors. Thank you so much for your time and for your attention, for anything you can give, and for any way you can contribute. We are always blown away by the support we get everywhere we go, and it validates every day we continue on our mission. We are proud to be Kicking It Forward to hopefully promote a future mental health initiative. We believe our mission relies on the generous contributions of peoples' time and experiences. That means we will seek diverse people who come from all sorts of backgrounds: industry experts, people with lived experience, and healthcare professionals. We need to fit it into their already busy schedules. This could lead to delays. In addition, video production relies on a number of parties. This means there are many links in the chain where we could observe hiccups, including planning, filming, editing, post production, delivery, etc. We will do our utmost to keep all our backers updated if any such delays should occur. At the moment CheckPoint is run by three people - one is full time (Dr. Jennifer Hazel) and the other two contribute when they can. Unexpected setbacks are a realistic possibility! We have reduced this risk by seeking business guidance and financial advice. You'll get exclusive access to a high resolution digital download of the entire series. This means you can watch offline any time, ad free. You'll get exclusive access to a high resolution digital download of the entire series AND a digital download of the soundtrack! This means you can watch or listen offline any time, ad free. If you show your support by pledging within the first 48 hours, you'll get an EXCLUSIVE high quality digital pin you can proudly wear online to show you were one of our very first backers. There are only 200 available, and each one is personalised with YOUR NAME. The pins look incredible (to see one you'll have to pledge!) Show the world that you believe in mental health care, and that you are passionate about what we at CheckPoint do. You'll get an EXCLUSIVE high quality digital pin you can proudly wear online to show that you support the cause. There are three to choose from and you can customise the colour! Show the world that you believe in mental health care, and that you are passionate about what we at CheckPoint do. For those about to back, we salute you. In addition in receiving our exclusive digital pin and download access, we'll also give you a big round of applause and our deepest thanks across Twitter, Facebook, Instagram, Medium and a special spot on our homepage, CheckPoint.org.au. If you show your support by pledging within the first 48 hours, your image will be shown on an awesome display of super awesome people - our Earlybird Advocates. This collage will be put into the first update we produce. Choose whatever image you want (within reason!) to show the world you are one of our very first backers and lead by example. There are only 40 spots available. In addition, you will be acknowledged in the CheckPoint Series credits! Show the world that you believe in mental health care, and that you are passionate about what we at CheckPoint do! Backers of this tier and above will be acknowledged and memorialized in the CheckPoint Series credits. Show the world that you believe in mental health care, and that you are passionate about what we at CheckPoint do! Designed by the incredible Victoria Kershaw, we have a LIMITED EDITION high quality ceramic pin available to show our backers how grateful we are. The pin will be delivered to you and you can check out a preview of it in the project page. Bear your flag with us! Our webseries cover art was designed by the exceptionally talented Toby Allen, aka zestydoesthings, creator of the inspirational "Real Monsters" series about mental health. Become a backer in this tier, and you'll receive a high quality print of the artwork he created specifically for this project. You'll be able to showcase your support for our journey with the black dog. Your name will be acknowledged in the webseries opening sequence. This is shown at the start of every episode. Choose what colour you want your name in! Or use an alias! We're super flexible and proud to sing our praises for every single person who helps by contributing this significant amount! If you show your support by pledging within the first 48 hours, you'll get to DEDICATE one of the episodes (any of the 16) to a person of your choice. This can be a friend, family member, someone in the industry who you admire, or even yourself! We believe mental health is so important and not something that should be hidden away or feared. Dedicating an episode shows you care about mental health and that you stand for our message of breaking down stigma together. There are only 16 available so get in NOW. To celebrate entering the last few days of the campaign, we are thrilled to announce we have updated the Decorated Flagbearer tier! This reward now features ALL INCENTIVES from lower tiers AND the exclusive Luxe Gold 'Black Dog' CheckPoint pin! You can increase your previous pledge to access these incredible rewards, or if you are yet to back us, this is a great opportunity to pick up everything we have on offer. Get to actually be involved in making the series! This is a limited tier so get in ASAP! Backers get to chat directly to our artists and animators to direct ideas for the characters we use in the series. These characters help display concepts we're discussing to improve understanding and help the series be more accessible. You'll get to leave your mark on the webseries, by teaming up with our amazing art team and helping to design the concepts we use. Choose the appearence of the character or even put yourself in the series! Our Black Dog Sponsorship tier is ideal for individuals or smaller teams that are passionate about mental health. Lead by example, and be an advocate for mental health and receive a Sponsor placement in the credits, and on the website for the series. Together we can beat the black dog. These tiers are for our generous corporate partners, who help CheckPoint make our dreams possible. - A CheckPoint Workplace Wellbeing Workshop in YOUR organisation - these are fully personalised and can increase productivity and boost profit. - NAMING RIGHTS - The Webseries will have your name in its title. - EXECUTIVE PRODUCER - your organisation will be listed in the credits as the executive producer of the show.